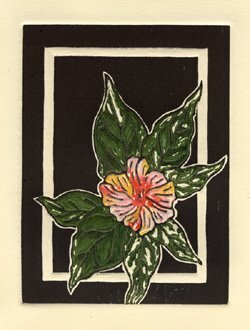 5″ x 7″ block print on Somerset paper with Graphic Chemical intense black ink and oil paint. The carved areas of the block were hand painted and then the surface of the block inked before the block was run through the press. My Chinese four o’clocks grow to over six-feet tall. They open in the morning and bloom all day before closing at around four o’clock in the afternoon.